We are Asheville through and through. We serve a lot of clients in Asheville, but even more than that, it’s “home.” There’s a comfort here that we’ve been hard-pressed to find elsewhere. Not sure if it’s the mountains (said to be some of the oldest on the planet,) the people, the climate or all the memories we have. Asheville and this area have become so much a part of us that we have a hard time even considering being elsewhere. Who knows. One thing we DO know – we LOVE Asheville. We also have a lot of kids. Kids need education. While we home-school our brood, we know that public education need everyone’s support. It’s not a matter of throwing money at it – it’s about making education a priority. Children (as cliché as this sounds) really are our future – and we need to take education seriously, and we need to put our money where our collective mouths are. So – we support a great local cause – the Go Local card. With this card, you not only get great discounts at Asheville businesses, you help support and fund schools in the area. For $15, you support the Asheville Grown Business Alliance, Asheville City Schools Foundation and you get to choose which school your dough goes to. PLUS – you get some sweet discounts. 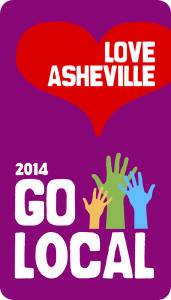 We’ve been a supporter of the Go Local card since it’s inception, and this year is no different. We’re offering a 15% discount on our services – so, for $15, you can get a good chunk off your web or design services. SWEET! Since December 1 is our “official” launch the timing couldn’t be better. It’s also “Small Business Saturday,” and the start of the new Go Local card cycle. Go get your card (you can buy them online or in person at various places,) and help support local Asheville businesses, Asheville schools and get a good discount on the bestest of the bestest web and design services. Everyone wins! Now, I sincerely must get back to my coffee. It’s the only thing that keeps me going on Black Friday. That and pie. And napping. And more coffee. And more pie. And more coffee.